Soy sauce is a 2,500 year old condiment that extends beyond borders and cultures. This dark sauce is made from fermenting soybeans with a combination of salt, sugar and sometimes wheat. Nowadays you can find both "naturally-brewed" or industrial soy sauce. The latter is chemically produced with artificial flavors and coloring and contains an overwhelming amount of salt. The two main types of soy sauce you'll find stocked in US grocery stores come from either Japan or China. 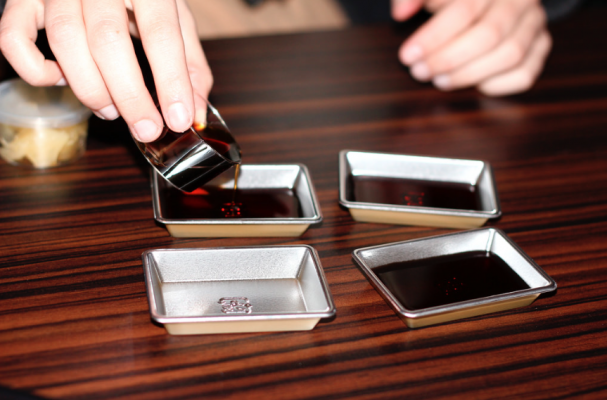 Chinese soy sauce has a thicker consistency with a saltier flavor. Traditionally, it was brewed with just soy beans, salt and sugar; however, in recent years wheat flour is a common additive. Japanese soy sauce is lighter in flavor with a sweeter finish. It is made be combining soy beans with roasted wheat. Tamari is a version of Japanese soy sauce that omits the wheat completely. Soy sauce is like a fine wine or vinegar, the longer it ages, the more complex and flavorful it becomes. As you might suspect, dark soy sauce is fermented longer than light soy. Most dark soy sauces found in the local grocery are Japanese while the lighter versions are Chinese. There may or may not be a label indicating the color so you will have to use visual cues to differentiate between the two. Either way, you'll want to reach for a soy sauce that fermented for at least two years.